It’s road trip time again. The need to get out on the open road and into all the little towns and cities that are usually far from the gaze of the tourist. Of course, no road trip is complete without visiting some of the iconic locations. However, being on the road means that we can mix it up a little, getting to destinations that attract tourists well before the big tour buses turn up. It also means finding secret locations, tucked away in places that even those who live in the country have never heard of. It’s about freedom and going where you want to when you want to. Welcome to Portugal, our latest location for our road trip. Here we enjoyed the long summer twilights of the northern hemisphere, eating and drinking the local food and wine, and exploring great places all to the beat of our own drum. If you haven’t done a campervan road trip in Portugal before, we can highly recommend it. It is without a doubt, one of the friendliest countries for those who like to travel in motorhomes and campervans. The Portuguese people collectively threw their arms around us and welcomed us into a country just made for road trips. Their easy going, friendly and casual attitudes extend in such a way that actively encourages you to see their country, to stay a little while, and of course, contribute to their economy. Free camping in Portugal is also a dream. It’s a country made for it, which is exactly what we did. Without needing to stop at a campsite, our road trip on the west coast of Portugal turned out better than planned. Overlooking the beach of Nazaré shown in the image below was just one of the fantastic locations we stayed at overnight. There are several apps and websites which we used to help us find the best, and authorised, free camping locations in Portugal. Park4night was the most accurate and we always seemed to be able to find somewhere in the towns where we planning to stay overnight. A lot of the directions left a lot to be desired, but in combination with the app and Google maps, we usually managed to find the correct location. The Park4night app is also very useful for finding places to park larger vehicles so that you can explore the towns. For those that get all concerned about people who free camp, often happy to brand everyone with the brush of “destroyers of the environment”, I can assure you, we left the areas we stayed in cleaner than we arrived. Fully self-contained, with our own toilet on board, you would never know we’d been there. Portugal is an easy country to drive in, although they do seem to have a decent percentage of people who like to drive like snails in 100 kph zones on the highways, and merging, well that’s just not really their thing. The best advice we can give is to be especially alert when changing lanes, exiting off highways and when merges are at play. The vehicles are left-hand drive and are driven on the right-hand side of the road. Unlike Iceland, where we did an eight-day itinerary recently, the road rules aren’t that different to what most people would be used to and there’s nothing difficult about driving here. In some areas, the roads are not in fantastic shape, but there are plenty of areas where they are. 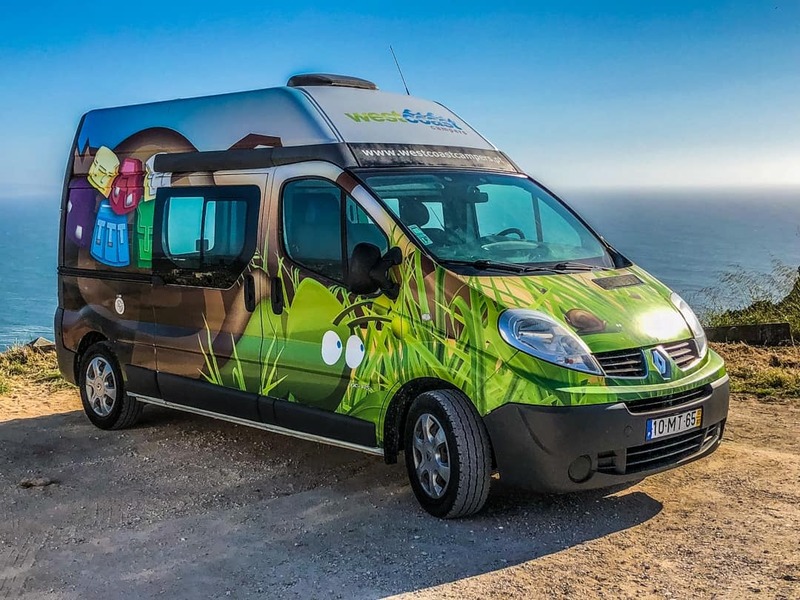 There are several options for hiring a campervan in Portugal, a burgeoning scene for passionate road trippers. As we were doing only a short trip of seven days this time around, we didn’t require a large motorhome. We wanted something compact, whilst still providing enough room for the two of us. We also wanted to be able to pick it up in one location and drop off in another. This was ultimately one of the deciding factors for us, as not all hire companies are capable of this as they only have one depot. Others, charge an absolute fortune for one way drop off fees, which negates the benefit of doing this entirely. 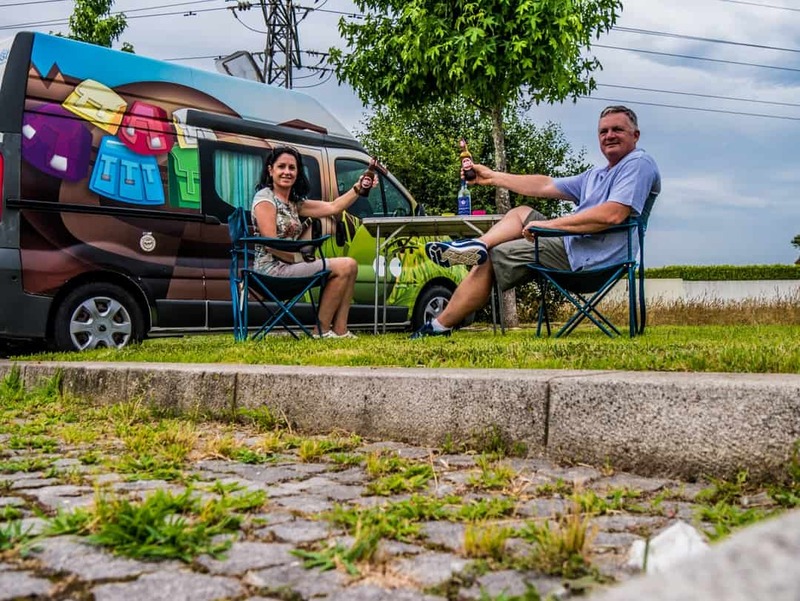 In the end, after all our research, we chose West Coast Campers who allowed us to pick up our campervan in Lisbon, the city we flew in to and returned it in Porto, the city we were flying out of. It was a perfect arrangement. They do charge a one-way fee but it is very reasonable. Our dealings and communication with the West Coast team were efficient at all times, and they were on hand to assist with any questions we had prior to our pickup. Everything about West Coast Campers says fun and freedom. 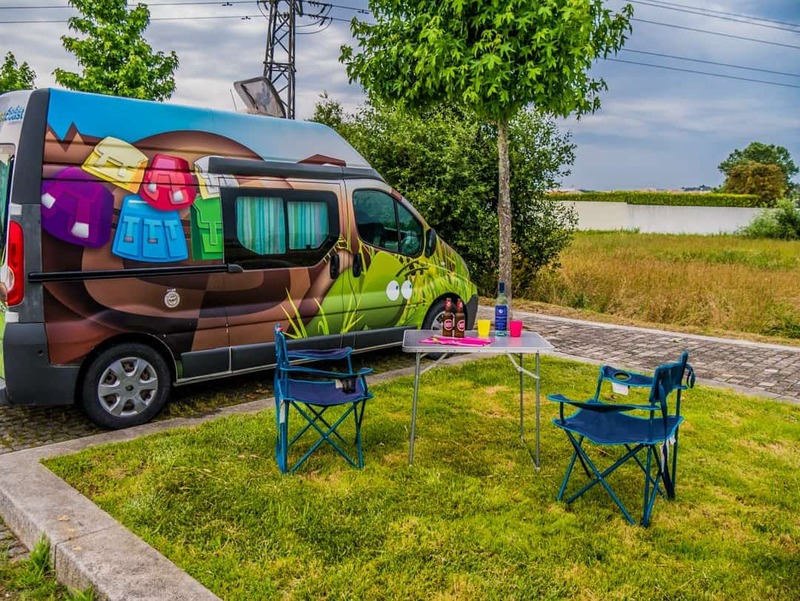 From their selection of vehicles to the additions like surfboards that you can hire also to the bright, not-to-be-missed murals on the campers. They might look like they are built to attract the youth market, and they are, but as we found out, some older crew like us can do the cool campers some serious road trip justice too. All bookings are completed online and it is very simple. Choose your dates, your vehicle, pickup and return locations and your extras. Once you have completed this and a few personal details, availability will be confirmed and a quote will be automatically emailed for you to check through and then proceed with booking if you wish. The minimum hire period is five nights. West Coast campers is a seven day a week operation, another useful feature of this company. Too often hiring companies will only allow pickups and dropoffs on a weekday which can be inconvenient to travellers on a specific timeline. There are five styles of campervans to choose from. Some will only accommodate two people, whilst others are for up to five people. Our tip is to check the vehicles are their size carefully before booking, to ensure you are comfortable with the space. As an example, we hired the ‘Hang Five’ campervan, for which the website notes that it is for up to five people (perhaps a few adults and some children). Knowing how we travel, there’s absolutely no way we would travel in this size campervan with any more than two. It’s all personal choice, but it’s just a factor that you will need to ensure you look into carefully to ensure your comfort is maximised. The bedding configuration is also important for a couple of reasons that I will go into more depth later. Points to note are whether the beds are fixed or rollaway. Some vehicles come with a portable toilet and shower. All vehicle hire comes with some very basic insurance included and it is not recommended to keep it at this level unless you have your own travel insurance. I love the way West Coast Campers brand their insurance as I think for those who might get a little confused with insurance, the use of these words speaks volumes. 1.Risk Taker – this is the most basic of insurance and is quite honestly useless in the event of damage to the vehicle or an accident. This cover gives you unlimited kilometres and roadside assistance, plus one driver. It does extend some coverage for damage to third parties. As you can see from this explanation, this isn’t really insurance at all. This is not about the company trying to be deceptive. In fact, they couldn’t be more upfront about this as it’s noted all over their website and they discuss this with you at checkout. It’s provided because there are people who don’t want to pay their extra insurance for two main reasons. Firstly, there are some people who are massive risk takers and never buy insurance of any kind, preferring to run the gauntlet. Unfortunately, we’ve seen too many people who do this, have an accident and then complain about the cost of the damage being charged to them or the excess. Secondly, there are people like us. We don’t take any additional insurance from a vehicle hire company, as we are fully insured ourselves. We have an annual multi-trip comprehensive travel insurance plan that covers everything we need including vehicle rental excesses. The deposit taken is also much higher, as you would expect. This is the excess, or maximum amount payable by the hirer, in the event of damage or an accident. 2.Take a chance – With the additions of tyre and window insurance plus coverage for two drivers, this is the middle of the road option. Pardon the pun. The excess is less than half of that required under the Risk Taker option. Tyre and window coverage is for one tyre and window only and does not include side mirrors or roof windows. 3.Stress-free – Like the words suggest this gives you everything the above two policies provide plus passenger insurance. Three drivers are covered under this option. The excess is the lowest of them all, but the daily insurance rate charged is obviously higher, in order to receive a lower deposit amount. Damage caused by your negligence. This covers a vast range of actions including driving whilst under the influence, driving dangerously, driving unlicensed (or if you are not noted on the hiring agreement), leaving keys in the vehicle and not being present. The insurance options only cover up to the amount of the deposit and for the first incident. This means that if you have a number of separate accidents, and there is separate new damage, the insurance will only cover you for the first accident, and you will be charged up to the maximum of your deposit. For additional damage and/or incidents, the full cost of the repairs will be charged to you. The excess is the amount of money that will be charged to you in the event of an accident or damage. It is also known as the deposit because this is the amount that the hiring company, in this case, West Coast Campers will charge to one of your cards, prior to driving the vehicle from their depot. Depending on the insurance cover you take out, the full deposit will be charged and will be the maximum you will pay in the event of one accident or amount of damage. I’m going to digress a little here into some related financial information as we see this causing issues all the time, simply because people don’t understand what happens to their money when deposits are taken. The deposits are not physically charged to a card that you provide to the hirer. They are put through as a pre-authorisation, staying in a pending mode, until such time that you return the vehicle. When an amount is pre-authorised it does eat into your credit limit, if you are using a credit card. So, for example, if you have a credit card with a USD$10,000 limit and your deposit amount is €2,000, your available limit to be used for the remainder of your trip is around $7, 600. If you are using an AUD credit card, the balance is even less at just over $7,100. You can see how this would get tricky if your credit limit was only $2,000. The deposit of the same value would render your credit card useless for the entire trip. In addition, if you return the vehicle without damage, and therefore the pre-authorisation is cancelled, it can take anywhere up to a few weeks for the funds to be returned to your account. Once again, depending on your credit limits and availability of other payment methods, this could leave you a little stranded. If you have damaged the vehicle in any way, and this is determined at the point of return, a formal amount will be actually charged at that point to your respective card. Many people use travel cards today. These are cards that operate like a credit card without the exorbitant fees that the banks charge. Travellers can put different currencies on them, and they can be used at ATMs to get local currency. They are slightly different to a credit card however in so far as they can only be used if the user has loaded actual funds onto the card. Even though it behaves like a credit card (usually Mastercard or Visa), you cannot buy on credit. Once your funds have run out you can’t use the card again until you reload funds. It is for this reason that you should never use your travel card to pay for a vehicle hire deposit. Similar to the example above. You may have loaded €2,000 onto your travel card, for use during your entire trip. If you use this card for your deposit, then the pre-authorisation actually locks the funds from use. You will then not be able to use any of these euros during your trip, meaning you will either have to load more or use another card that attracts fees. Once the pre-authorisation is released, long after you may have finished your trip, the funds are released and must sit on your card to use next time. If there is a next time. The best money tips we can ever give is to ensure you have multiple payment methods with you, for those just in case moments and to never put a deposit onto a debit card or a travel card. If you are putting it on a credit card, make sure you know your credit limit and ensure you have plenty of space on it, should it be your only payment option. Wow! There are so many extras available with West Coast Campers and the only issue would be finding the space to put them all in. With beaches that are well known for producing mammoth waves, why wouldn’t you hire a surfboard and give them a crack yourself? For those who aren’t quite prepared to get thrashed by the ocean, there’s a more sedate paddleboard, or a wetsuit to try and keep yourself warm in the freezing waters of the Atlantic. Take advantage of the warm weather in Portugal with a variety of outdoor equipment such as tables and chairs, barbeques, and bicycles. Or, in winter you can throw in a portable heater to warm you up. With such stunning weather on offer as we drove along the west coast, we were so thankful for our small table and fold up chairs. They got used every night as we sat outside the camper, eating local foods we’d collected along the way and drinking some of Portugal’s wonderful wines. We had our own wifi to use throughout the trip but it was good to know that you could also hire it as an extra for a one-off payment. All of the extras are available for selection on the website as part of the booking process. During the summer, the staff at West Coast Campers are on the go all day, checking out their vehicles. As such, they have the checkout process down to a fine art. It’s an efficient process that involves paying the final balance for your hire, finalising any insurance you want to take out, assigning drivers, processing the deposit and doing the final vehicle check. You will need to be over the age of 18 to hire a vehicle. If any of the drivers are under 25, it is mandatory to take out a higher level of insurance. An International Drivers Permit is not required. Thankfully, these forms of identification seem to be fading into history. It’s been quite a while since we’ve needed one. A copy of your passport and your own country’s drivers licence is sufficient. The most important part of this process is checking out, and recording, the condition of the vehicle. This is the part that protects you as the hirer and prevents any unwanted surprises at the end when you return it. Irrespective of whether the hiring company is trying to speed up this process or not, take your time and do a thorough inspection of the vehicle. We loved the West Coast Campers approach to this. They were extremely willing to discuss any issues we pointed out and were more than accommodating of the time we took to inspect. This tells us straight away that this is a reputable company. A big tick from us. A member of the company’s team should inspect the vehicle with you, marking out any damage on the condition report. It is important that you point out anything in addition to what they find and have that noted, however small or insignificant you think it is. If there’s a mark, a scratch, a dent, we mark it down. We also take photos as we go, further proof of the damage that existed pre-hire. Usually, Stirling will do the walk around with the staff member, and I take the photos. It’s not about being pedantic, this is your insurance policy as well and the consequence of not recording this properly could mean your loss of deposit at the end of your hire. Remember to look for damage inside the vehicle as well as externally. Also, remember to check underneath and on the roof as much as you can. Don’t just take someone’s word for any of this as they are more than likely not going to be the same person who checks your vehicle back in, especially if you are doing a one-way hire. Also, don’t forget to check out the “hirer’s grocery store” at the depot before you leave. We’ve seen this process happen before at other depots and think it is such a great idea. Most people will return from a hire with leftover food and staple items like toilet paper and paper towel. Food items like pasta, rice, salt and pepper and sauces are usually purchased in volumes too big for people to consume during their hire. People can simply look over the items and take what they want, and of course, put anything back that they themselves haven’t used upon their return. The best thing about our ‘Hang Five’ was that we were never, ever going to lose it. Covered in custom-made bright decals of a snail in the grass, we were a stand-out everywhere we went. Finding it in a carpark full of white vehicles was a dream! At a little over two metres wide, five metres long and 2.55 metres high, it’s an easy vehicle to drive and very easy to park. As usual, when you are driving high-tops, extra care needs to be taken when driving under low bridges, undercover carparks etc. The ‘Hang Five’ was a manual, as are all vehicles in the West Coast fleet. As mentioned above, this vehicle, a Renault Trafic can carry up to five passengers. 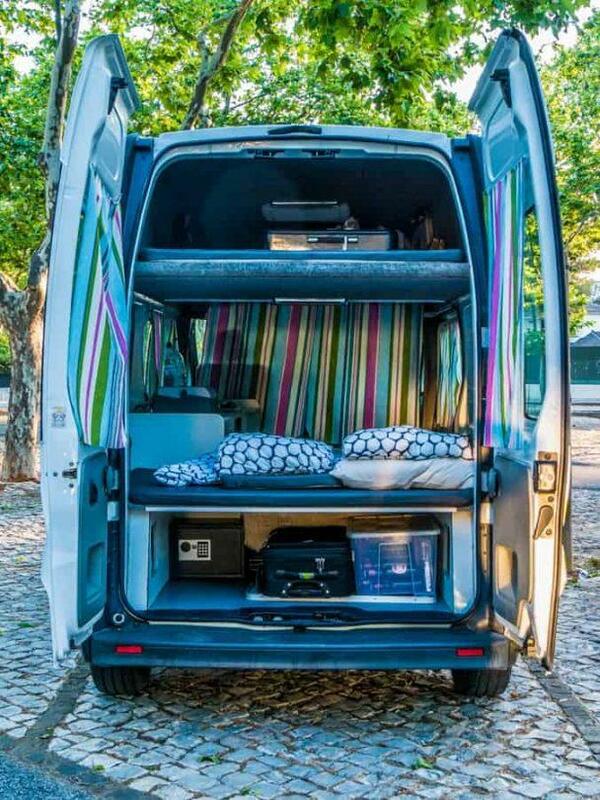 If you are trying to save money and cosy environment isn’t a problem, then this campervan would be an economical option. It would also work for two adults and two children although, once again, it’s important to check the bedding configuration. Three passengers may sit in the front, and two in the back. As I’ve already said, however, this campervan was perfect for two people, allowing plenty of space to move about and to be comfortable whilst driving. This vehicle, a diesel, had two possible areas for sleeping. On the main level of the vehicle, the rear seats fold out and join up with the storage area at the rear to form one double bed. The kitchen cabinetry runs down one side, meaning the width of the bed is slightly less than the other onboard. Immediately above this area, suspended up in the roof area, is another fixed bed. This one has full width making it a better choice in some ways than the one beneath it. It’s worthy of pointing out though that you need to use your best ninja skills in order to access the rooftop bed. Without a ladder, this area with a small amount of clearance between your body and the roof of the vehicle is quite tricky to get into. As I am a smaller person, I was able to get up there a little easier than the broad-shouldered, six-foot Stirling. Each night we would amuse ourselves as we tried a different way of getting into bed. Feet first was too difficult, going head first meant we had to do a u-turn at the end and come back to the front. Again, ok for me but at times I thought we were going to need a can opener to get Stirling back out. 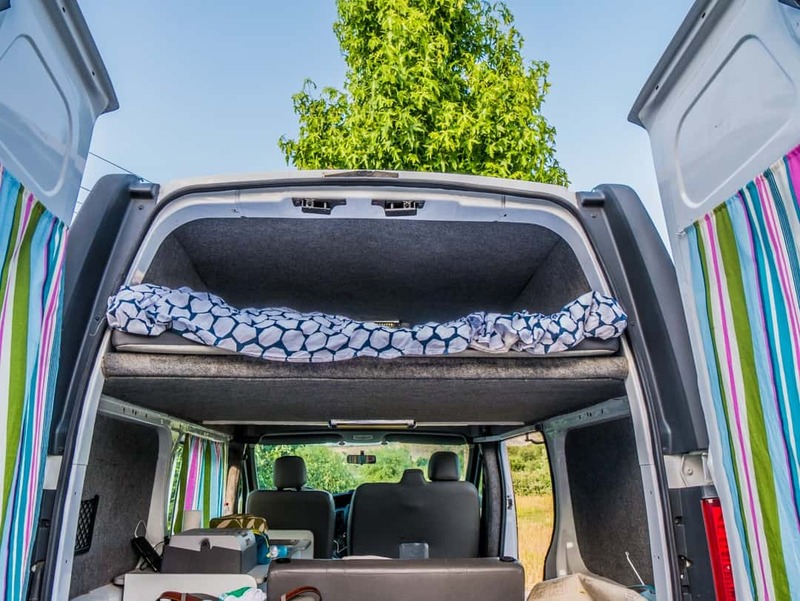 The great thing about having only two people in this particular campervan is that when we finally decided we would use the higher bed, we could keep it made up all day. Using the lower bed means you have to pack it up every morning to free up space. Using the high bed also meant we could leave our suitcases out on the rear storage area for quick access. It’s all totally flexible, however, and on occasions when we had amazing overnight parking spots, we would just make up the lower bed to use for general relaxation. The campervan has curtains but if you are a light sleeper I’d recommend taking an eye mask. It is all fully lined as well which does help to insulate from the cold and heat. The camper had built-in cupboards with very good storage and a kitchen sink with running water, which is always very useful. An indoor table can also be assembled although due to space and the outdoors being so nice, we mostly used the outdoor table and chairs. Basic plastic plates and cups and utensils are provided, along with a one-ring gas stove. Being portable meant we could also cook outside the campervan. The rear doors open providing access to the storage areas. It’s also great to be able to keep them open when you are parked up. It’s great for cooling down the vehicle quickly and for checking out some of the amazing views we had. There are two 12-volt charging spots in the vehicle. Also included is an auxiliary battery as well as the main vehicle battery. Normally the auxiliary battery is used for charging of your devices and even the fridge when the vehicle is not going. Auxillary batteries are then kept charged when the vehicle is being driven. However, in this vehicle, and as we understand it, in others the two batteries are not connected. This means that there is no charge to be had from the auxiliary battery when the vehicle is stationary. Add to this the fact that the fridge on board is actually a cooler and it makes life a little less user-friendly. The cooler, also a Waeco brand is never going to be something we warm to. You might remember our issue with the same cooler in our campervan in Iceland. When you aren’t driving huge kilometres a day (which is quite normal in Portugal, given its size), the cooler doesn’t really get a chance to do just that. It doesn’t cool down. Instead, we were told to buy ice, which we had to every day, in order to keep our food fresh and our beers and wine cold. It really defeats the purpose of having a cooler onboard. I can imagine for people who don’t worry about food too much that this wouldn’t be an issue, but it certainly is for us. Having now hired two campervans with these coolers, we won’t hire one again unless it has a proper refrigerator that can be charged properly. The alternative is to plug into mains power but you can only do that at campsites and we’d prefer to stay away from them also. As mentioned above, some of the vehicles do not have toilets as a standard inclusion, but it was excellent to see that West Coast Campers provide them as an extra. We hired a portable chemical toilet for the trip which really helps life on the road. It also ensures that we continue to be responsible travellers and can quite easily fight the good fight when anyone wants to argue about the world of free camping in campervans or motorhomes. When the toilet wasn’t being used, it stayed packed away in the rear. When it was being used and at night, it was simple enough to place it in the front. There are plenty of authorised locations around Portugal to dispose of the waste. This is usually the easy part, provided you know where your location is and ensure that you have left plenty of time to get there. The vehicle must be returned with a full tank of fuel and must be returned in a clean state. Failure to do so will incur an additional charge. If like us, you rented a portable toilet, then it too must be emptied and cleaned. Where are the West Coast Campers locations? West Coast Campers operate out of Portugal (Lisbon, Porto, Faro) and Spain (Malaga, Seville). You can pick up and return from any of these locations. The locations of the depots are usually in industrial areas, a little out of the main towns. Public transport, Uber and taxis are usually the most common way of reaching the depots, however, they also operate private pickups and dropoffs for an additional charge. Portugal is such a small country that doing a road trip is one of the best ways to see more of the country. Finding great locations to stay for the night is incredibly easy, and the people of Portugal welcome your presence. As is always the case when we travel like this, we stop in small villages and towns along the way, spending money in as many as possible. We buy from local vendors at the markets and support small businesses where we can. This was one of the easiest road trips we had, with small kilometres, great locations, a great vehicle and all the freedom we wanted. Thanks to West Coast Campers who provided us with a competitive rate on our campervan hire. Going on a road trip around Portugal sounds like the adventure of a lifetime! I’ve never traveled in a camper van but it must be quite an experience. I was shocked to read about the procedure to book a van and all that comes along with it. It’s more complicated and more expensive than a rental car. But in the end it ends up being the best option. Will keep it in mind shall we decide to hit the road in style & comfort ? It’s not complicated though, that’s the thing. I provide this advice so that readers and potential road trippers are well informed but it’s not hard. Forearmed is forewarned.